Dedicated to Miss Gladys Mollart. 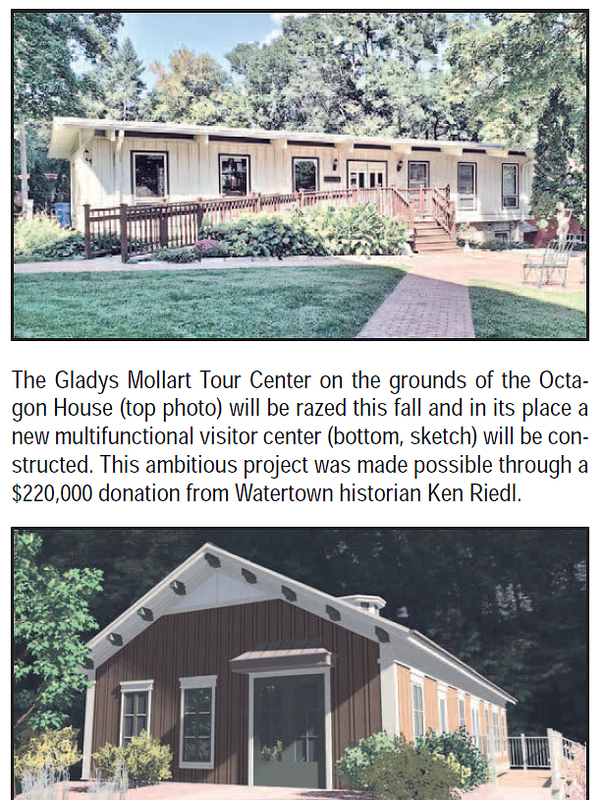 Lee Block, president of the Watertown Historical Society, and chairman of its building committee, presided at a brief outdoor dedication ceremony of the tour center Sunday afternoon, and placed a plaque on the building, hereafter to be known as the “Gladys Mollart Tour Center”. Presentation of the plaque, which was donated by Ed Hulbert, society board member and a member of the building committee, had been kept a surprise for Miss Mollart. Block introduced special guests who attended the dedication ceremony, Dr. James Morton Smith, director of Wisconsin State Historical Society, Ray Sivesind, state director of sites and markers, Jerold Dommer, architect for the new building, Mayor Kenneth Wilkes, city aldermen, Clarence Hartman, Chamber of Commerce and two descendants of the Richards family, Mrs. Rodman Moesta, great-great-granddaughter of John Richards and Mrs. Georgia Richards Reynolds, great-granddaughter. Mrs. Moesta, with her husband and two daughters, Maureen and Elizabeth, had flown in from Detroit for the ceremony. Mrs. Reynolds lives in Watertown. Dr. Smith and Sivesind responded briefly to their introduction. Smith told the assembled persons that his goal at the Wisconsin Historical Society was to “strengthen the ties between the state society and the local societies. This is a tribute to what can be done at the grass roots level by a dedicated person and a dedicated historical society,” he said. Sivesind, a longtime friend of the Watertown Historical Society, expressed pleasure and congratulations in this new achievement. Miss Mollart, in her response to the surprise dedication of the building in her name, said “we have always been grateful to the Richards family and are pleased to have two members of the family with us today.” She read a letter from Mrs. Harvey Richards from Florida. Mrs. Richards, widow of the late Harvey Richards, who was very instrumental in presentation of the property to the Historical Society, had sent red roses for the Octagon House on this special occasion. Block paid tribute to many who had helped the Historical Society achieve its plans, reiterated the many advantages of the new building, and named his building committee, Richard Hoge, Miss Mollart, Mrs. S. J. Luchsinger, Mrs. Harold Peterson, E. F. Hulbert, Robert Bauch and Mrs. Donovan Mabie. Following the dedication ceremony there was an open house for visitors. Mr. and Mrs. Mabie, custodians who live on the Octagon House premises, were given special commendation for their part in the moving this summer into the new tour building, and also had their new apartment in the tour center open for guests. The Watertown Historical Society is in the process of creating something brand new to showcase what is old, and wonderful, about Watertown. Starting in early October, the circa 1970 Gladys Mollart Tour Center on the grounds of the Octagon House Museum will be demolished, and a new multifunctional visitor center will be constructed in its place. This project is made possible through a generous gift provided by Watertown historian Ken Riedl, who is a long-time member of the society’s Board of Directors. In 2014, Riedl pledged to donate $220,000 to the historical society to “improve the manner in which its archives are housed and to provide a platform in which to display and promote artifacts of Watertown history.” The board spent three years brainstorming the most effective way to utilize Riedl’s extraordinary gift and ultimately decided to pursue the reconstruction of the outdated museum visitor center. The existing visitor center lacks handicap-accessible restrooms and one-half of the main level is occupied by a caretaker apartment which is no longer in use. 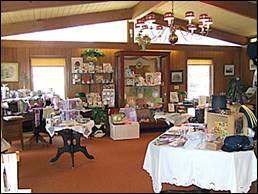 The society’s archives and collections that are housed in the lower level of the visitor center also require reconfigured space to be property stored and maintained. 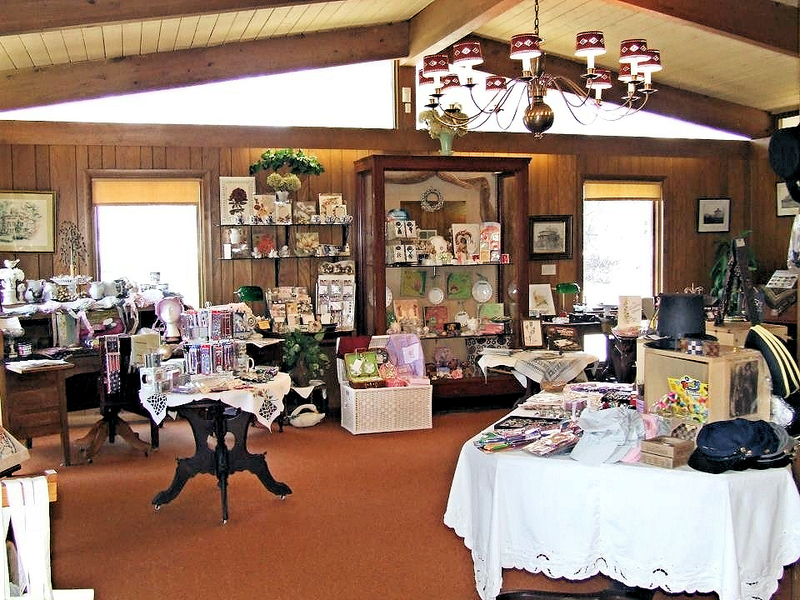 In 2017, the board hired Kontext Architecture of Sun Prairie, WI, to facilitate the reimagining of the visitor center into a new center for local history where the society could hold special events, make its archives accessible for public research, and develop new and ever-changing historical artifact and photo displays. In addition, the society also plans to create a touch and play area within the new visitor center where children can handle replicas of toys originally used during the early days of the kindergarten movement. The first kindergarten class in America was held in Watertown in 1856. The structure that housed those early classes was relocated to the museum grounds in 1956 and is open for viewing. After much discussion and quite a few revisions, the board voted in May to approve design renderings of the proposed new structure, and in July hired RJ Construction of Watertown to serve as general contractor for the project. The reconstruction will consist of the demolition of the first floor of the existing visitor center, starting the second week in October. A new “panelized” structure is being built in a climate-controlled environment by Windsor Building Systems of Madison, WI and will be assembled onsite in early November. The new structure will be built on the existing building foundation. In addition to the building reconstruction project, the board is exploring options for archival storage and attractive display stands and cabinetry to enhance the museum visitor experience. The board also wishes to raise $50,000 in conjunction with this project to create a designated fund for future museum improvements and operating expenses. The endowment campaign has been kick-started with a generous $15,000 grant from the Joseph and Sharon Darcey Foundation. Lampe said the main floor of the new visitor center will feature a ticket sales and gift shop area with adjacent restrooms. A new entrance for this space will be created on the west side of the building. She said the society would like to develop a short video for guests to watch about the Octagon House before starting their tour, which could be viewed in this area. She said the portion of the main floor currently occupied by the apartment would become space to hold rotating exhibits and special events – such as wedding and baby showers - with a seating capacity of 40 people. The lower-level, Lampe said, will be redesigned to make better use of the existing space for collections management and the housing of the society’s precious photo and paper archives.